N.T. Wright is certainly one of the most polarizing popular theologians of the day. A prolific author and speaker, his theology has recently been a challenge to liberal and traditional Protestant theology. His theology and insight have had an impact on many American theologians and stirred people to engage his criticism of evangelicalism. 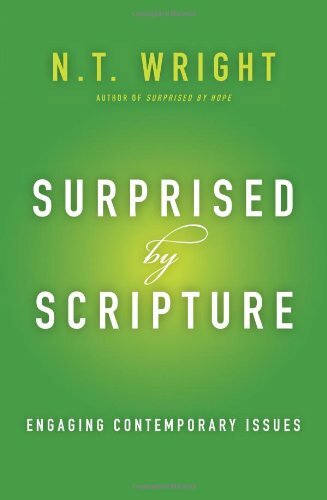 One of his latest works, Surprised by Scripture is a collection of essays given during the last decade (ix-xi). The source material of Surprised by Scripture brings an admirable diversity to the volume. At times however it is also surprisingly repetitive. Even in the opening preface Wright acknowledges that this material has been presented before (xi). Readers of Wright’s previous works will certainly find many familiar sections and phrase (e.g. chapters 4 & 5). For instance, one of the major themes Wright touches on is the effects of Epicureanism on modern theology. In an excellent introduction to the concept (chapter 1), Wright explains both the origin (6-18) and Christian response (18-25) to Epicureanism. These same features dominate later chapters extensively (chapter 7-9) with some sections containing almost identical concepts (e.g. 146-149 and 158-162). These shortcomings are more the fault of the publisher (HarperOne) than Wright himself who presented these initially as stand alone essays. Despite these repetitive elements, the greatness of Wright’s writing remains on display. With excellent chapters on eschatology (chapter 5), the problem of evil (chapter 6) and the value of the church in the future (chapters 11 & 12), Surprised by Scripture remains an excellent example of what Wright’s constructive theology can bring to western theology. Conservative readers will certainly be challenged by Wright’s views on the historical Adam (chapter 2) and ordination of women (chapter 4). Because of this, this collection of essays is still an excellent introduction to the writing of N.T. Wright and his theology. However, individuals familiar with Wright’s writing can pass on Surprised by Scripture because of its repetitive content.